Home of the NFL's Atlanta Falcons and the Peach Bowl, several SEC championships, Multiple Super Bowls, Final Fours and Olympic basketball. one of the world's truly unique exteriors. Very straight forward bowl layout, but very impressive at capacity. Last edited by www.sercan.de; February 8th, 2010 at 02:39 PM. It looks a bit like a Japanese temple from the outside to me, mainly due to the roofstructure and shape. It looks like a Circus tent from the outside and is nothing special... 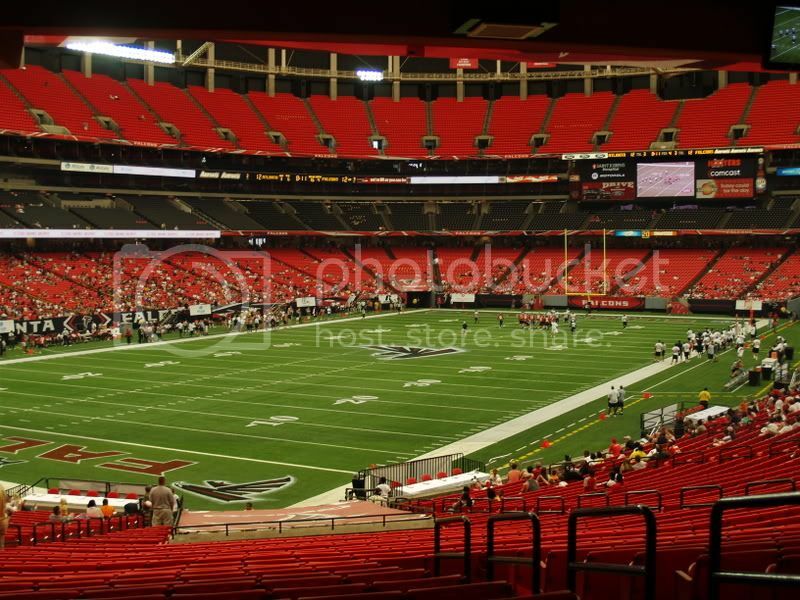 I absolutely hate Dome's they just don't have what i like in Stadiums... I.E the abiltity to have some proper turf. I love the way it looks on the inside! It is nothing special in terms of seating layout but something about it I really like. Not to mention the Ying Yang Twins made a song called the "Georgia Dome".lol. I think its special. Nothing else like it out there. I was reading that special patterns can be lighted in the roof, just like Allainz. Anyone got pics? For American football purposes, Infill turf does just as good of a job as a natural pitch, though like any infill surface, an entire natural pitch could be rolled onto it just like at Qwest. Both methods are already FIFA approved. Its the 21st century now. Technology could give it a proper pitch if they liked. I imagine though, the variety of activity would discourage it. Pretty cool stuff. 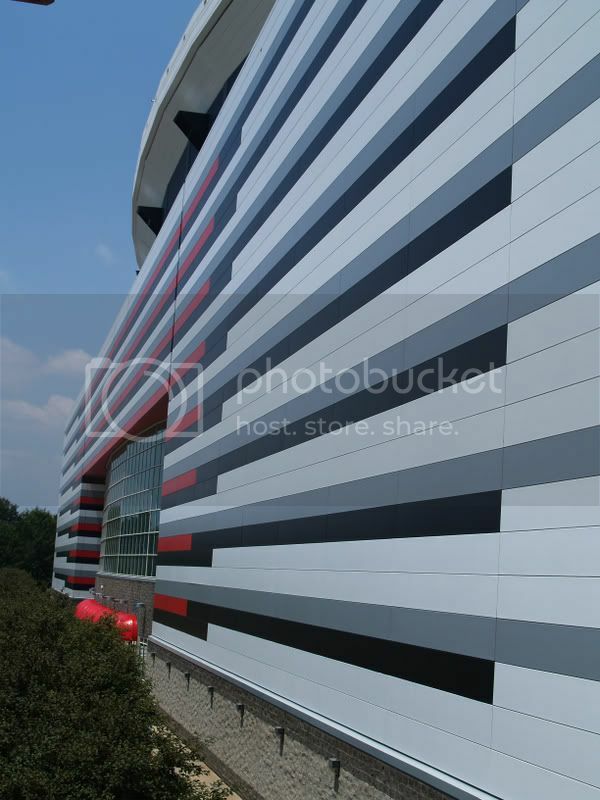 I like the colored striped on the facade. Sure, if you like playing on synthetic grass then thats great. Personally I'm a traditionalist, nothing beats playing on natural ground. Also, as much as its unqiue, it still looks liek a Circus Tent and there are many places that look a millions times better. It's very impressive on the outside (actually adds to the skyline), but inside it's not a particularly impressive stadium. Almost all about capacity, rather than comfort. Did the architects worry about the roof being to low? 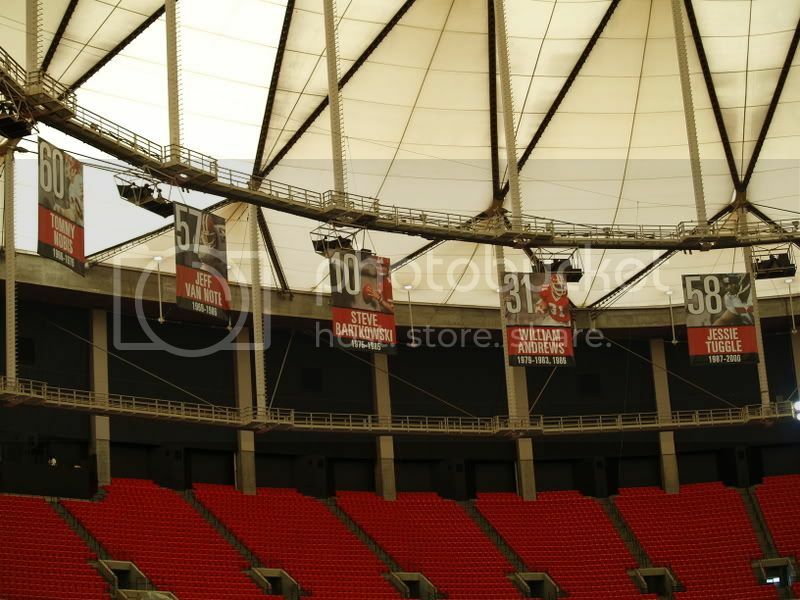 I wonder why there is this huge wall above the third tier... makes the rest of the stadium look smaller on those pictures. But I'm sure in reality this roof construction looks very impressive and contributes to a loud atmosphere. Do you know the capacity of this garage? Looks pretty big... if the whole building is used for this purpose. That's the Georgia World Convention Center. 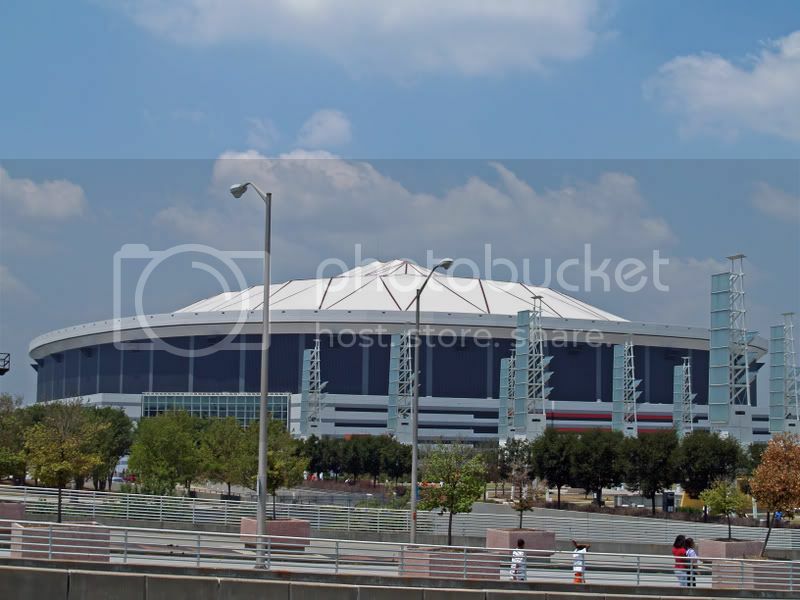 Its is a common practice to place domed stadiums or arenas either adjacent to or attached to convention centers. Most convention centers at least have an attached arena. The site has a heavy rail stop. I imagine roof height has to do with use. Punts can go very high. 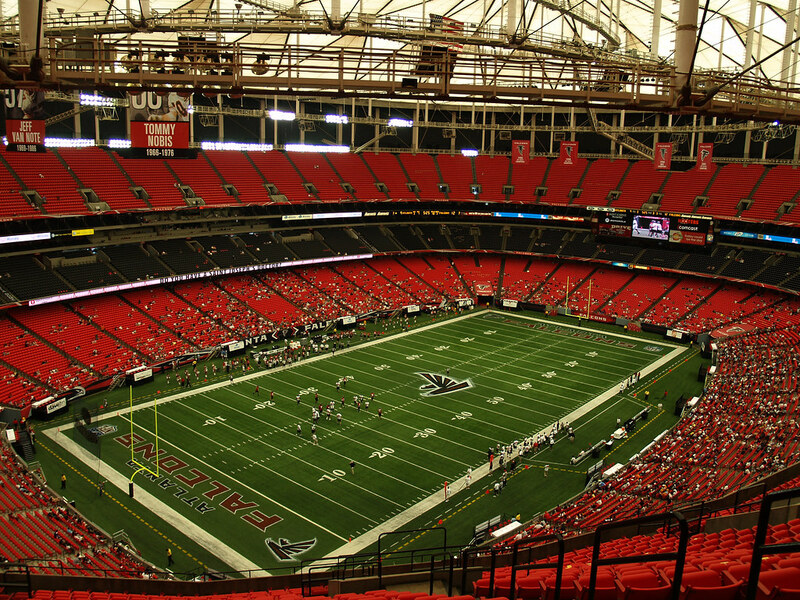 They also may have wondered if the Braves would play there at some point between stadiums or if they never built one. Ceiling height would definitely be an issue at that point or you'd have a Tropicana Field situation. Do not care for this one. For some reason it looks old and the exterior is not that attractive. LOL...I was about to say the same thing. Looks like the wall is at least 15m high. I'm not a great fan of domes but this one aint too bad. I like the seat layout and the exterior is ok but the high roof just spoils it. I don't like this stadium, it looks like a cirque tent! The base looks good, but why such a ugly top. ^We have been asking Europeans such questions forever. Not to mention the Ying Yang Twins made a song called the "Georgia Dome".lol. lol, I'm not sure if you are aware of this but they aren't referring to the Stadium. They are talking about getting some REAL Georgia Dome... if you get my drift. $150 million renovation. No surprise that open plaza style of Ford Field has caught on. The enhancements currently being contemplated include the construction of an atrium at the D Gate entrance to the Dome, which would include retail stores, restaurants and themed entertainment. In addition, plans are being developed to expand and upgrade the club seat section, add a number of additional suites, and create or upgrade dining and entertainment venues throughout the Dome. This is to compete with Houston for the 2009 Superbowl. 2010 was promised to the new Jets Stadium if completed.